The city of Annúminas was the City of Kings of Arnor, the North-kingdom of the Dúnedain. It was built on the shores of Nenuial, Lake Evendim, and was home to the Scepter of Annúminas (symbol of the kingship of Arnor) as well as one of the seven palantíri brought to Middle-earth by the Númenóreans. When Arnor splintered into the three successor-states of Arthedain, Cardolan, and Rhudaur, Annúminas was abandoned and fell into ruin. At its height, however, it must have been truly a wonder to behold. This sage of the Dúnedain has come to the half-sunken ruins of the city in search of the secret and forgotten lore of her people. It appears she has uncovered a relic of ancient Arnor amongst the ruins! She wears a supple leather waistcoat with detailed topstitching over a robe of the finest wool, dyed a beautiful blue like the sky reflected in Lake Evendim. Her warm, peaked felt hat is decorated with two carefully-tinted feathers. 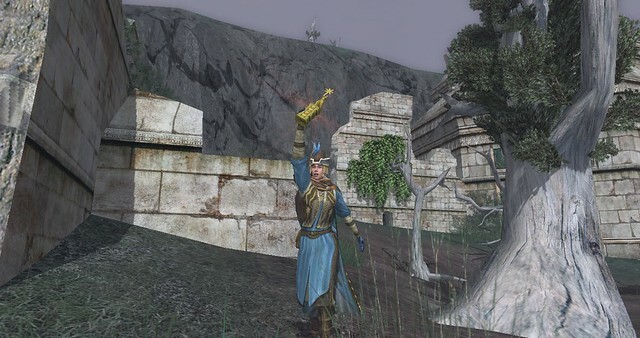 Finally, a mantle and cloak protect her from the cool, misty weather that pervades the shores of Evendim. Both her cloak and robe are emblazoned with the Star of the North-kingdom, in honour of her journey’s purpose. “Sage of the Sunken City” is a title that can be earned in-game for exploring various locations within Annúminas. 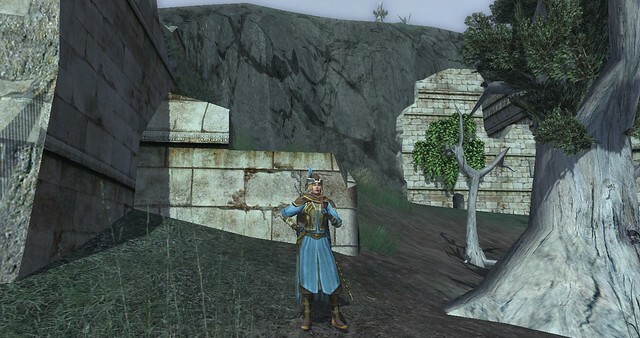 The title and the robe (one of the very nice Wardens of Annúminas barter rewards) together inspired this outfit. I really enjoy the Wardens-themed cosmetics (as I’m sure is pretty obvious based on my recent Battle of Fornost collection). Just adding an insignia, like the seven-pointed star, to old cosmetics that have been around forever really spices them up and adds new interest. I really hope we see similar sets for new areas in the future, or even added to existing reputation factions. Tips: Hats with the same skin as Glamír’s Feathered hat can be found as world drops and (I believe) at skirmish camps from the light armour quartermaster. The Ancient Annúminas Statuette is a really cool pocket item that can be purchased from the Wardens of Annúminas reputation vendor when you have reached kindred standing. In addition to its solid stats for a level 40 teal item, it is a “clickie”. That is, clicking on it will result in the special animation/emote shown in the screenshot above. I really love this item, and have kept it in all my characters’ vaults, just so that I can use the animation from time to time! 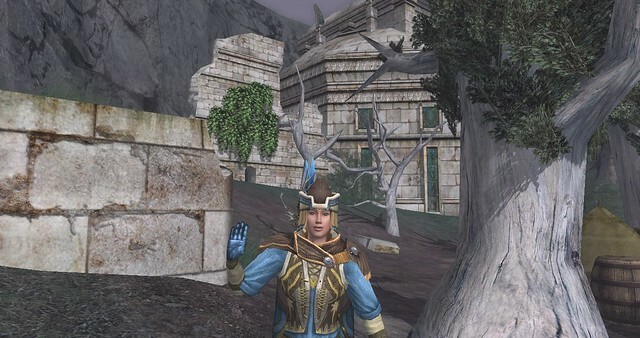 This entry was posted in Outfits and tagged Arnor, blue, brown, cloak, cloth, hat, Lore-keeper's Armour, Raiments of Long Memory, robe, sage, tailor T2, tailor T3, Woman. Bookmark the permalink. Lol I never knew about that statue! Cool item! The unique powder blue coloured robe is one of my favorites too. You just inspired me to dust it off and use it again! Here, here! I managed to copy this great outfit. Even with the statuette. Awesome!! Great shots, I love that you even did one with the statuette!